Anton Kozlov, a mountain man who wanted no part of trouble, had escaped Russia and made a life for himself living on and near Battle Mountain in Nevada. Anton is asked to do a ‘favour’ for a US Cavalry officer – to retrieve a mail-order bride from a stage station and return her to the cavalryman. It sounds easy enough until Anton learns that the stage has broken down near a notorious nest of outlaws. 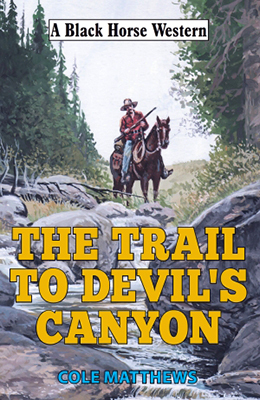 Anton manages to rescue Lucy, the cavalry officer’s bride, and they slowly make their way back to his cabin in Devil’s Canyon. However, the journey is fraught with danger, and their arrival at the stockade spells future trouble when it becomes apparent that Lucy’s husband-to-be has endangered them all by committing atrocities against the local Paiute tribe. Will this be the last chance or the end of the line for Anton Kozlov? This is the first Black Horse Western to carry the author name of Cole Matthews but it is not the first western from this writer as he has had six published under the name of Matt Cole, one of which I have read and enjoyed. Like that book, this one also begins with a poem. 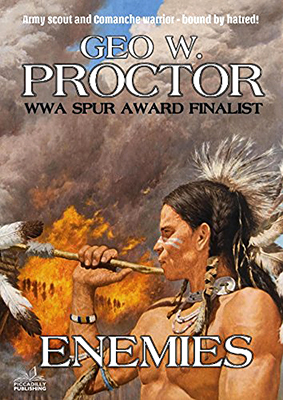 Once again the author has created a terrific cast of characters and a twisting storyline that will have you guessing as to the outcome, such as how anyone can possibly escape the stockade when it’s completely surrounded by vengeance seeking Paiutes. There’s plenty of action, some of which is quite brutal. The pace of the book is excellent and the ending ties everything up neatly. There is one thing that I wondered about though, and that was that the author has Kozlov armed with a Hawken rifle – a single-shot weapon I believe – and Kozlov fires at will with this gun without pausing to reload. Still this error is easy to overlook and it didn’t spoil my enjoyment of the story and it hasn’t put me off wanting to read more by this author. They had sworn to kill each other – an Army scout haunted by the brutal slaughter of his wife and child, and a fierce Comanche warrior who’d suffered his own tragic losses. But when Black Hand and his Quahadi band of the People were finally driven in defeat to a government reservation, Jess Younkin figured he could at last get on with his life. Instead, life passed them both by, as a new, more civilized West took hold, with no place for roughriding cowboys or hot-blooded braves. But now Black Hand has broken free; Younkin has signed on for one last scouting mission to track him down. And it’s only a matter of time before these two enemies meet, alone on the battlefield – warrior to warrior – in a bloody showdown that can end only one way…. Having read a number of books written by George W. Proctor, all published under pseudonyms, all of which I enjoyed, I had high hopes for this one and it certainly lived up to my expectations and more. Starting in 1875 we witness the sad ending of Black Hand’s freedom and the final exchange of words between him and Younkin. The story then leaps forward in time to the very early 1900’s and we see how the two main characters have aged and struggled to fit in to the changing world. Black Hand’s yearning to once again see the land he once roamed at will leading him to join three young Comanche in a breakout from the reservation. Black Hand’s vision telling him he will be fine as long as he doesn’t kill, but riding with others eager to prove their ability as warriors this will be a hard challenge to keep as they are forced to steal from whites in order to survive. Proctor’s character studies are terrific, his dialogue snappy and often laced with humour. His descriptions of age and how the modern world makes many of the ways of the past redundant something we can all relate to. But new ways aren’t always the best, witness the attempt to pursue Black Hand by a posse riding in noisy automobiles to prove this point. Action scenes are well-written and hard-hitting and the pacing of the story is excellent too. Even though I’ve mentioned automobiles, it’s really only this short sequence that moves the story from being a tale set in the 1800’s into the turn of the century, the majority of the book could take place in those earlier years. Dust, the need for water, horses, weapons, the young know-it-all cavalry Lieutenant charged with bringing the Comanche back to the reservation, the grizzled scout and more will soon have you forgetting the book is mainly set in 1904. The ending is tense, moving and violent, finishing the tale in a fitting and memorable scene that will stay in my mind for a long time to come. Enemies is certainly a book worth reading and must rank right up there with the best of George W. Proctor’s storytelling. Seth Vance was the sheriff who could not be shaken. Hard, tough, firm but fair. Until the time of the two Mexicans. They shot up the stage but for one the only reward was the gallows. Then in a night of searing violence Seth’s sister was brutally slain. And the sheriff’s composure cracked. Hell-bent on vengeance, Seth sought out the killer, mercilessly handling anyone who crossed his path, treating deputies and the woman he loved with callous cruelty. And amid the raging elements of a river in torrential flood, Seth came face to face with the truth – a truth that was almost too much to bear. According to the copyright page of my NEL edition this book was originally published by Robert Hale in Great Britain in 1968 (long before they put their westerns out under the Black Horse Western banner). I’ve also seen Berkley copies dated 1968. 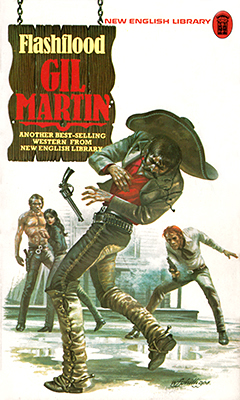 I’ve owned all seven of Gil Martin’s westerns for a long time but have only just got around to reading one. Martin’s style could easily be called hard-boiled, it’s certainly dark at times and the violent scenes are fairly graphic in description. Emotions are well written, especially the confused feelings of attraction between Vance and Dolores. Fear and hate come across strongly too. Although the twist ending was easy to work out way before the author reveals it (the who anyway, not the why), the story proved to be a great read and grabbed my imagination from the opening scene to the last savage gunfight. Flashflood is only 104 pages long making this a fast read and it proved to be a very entertaining book indeed. It certainly left me eager to read another of Gil Martin’s westerns very soon. I must also mention the cover painting done by W. Francis Phillips who’s captured a scene from the story extremely well.